Revised and expanded July 2018. Rosalie Sugrue, Theme Scheme. 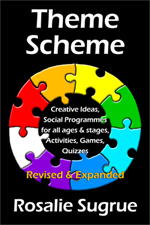 Creative ideas, activities, games, puzzles, plays, quizzes. (Wellington: Philip Garside, 2014) 157 pages. Theme Scheme is packed full of ideas that are, as stated on the cover, fun and practical, requiring minimal equipment, resources and time to prepare. These are commendable qualities for activities and readers will not be disappointed. There are ideas here that could be developed into an evening’s programme or used to help people relax and feel comfortable with each other at the beginning of any meeting. 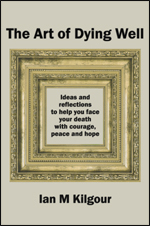 As the author writes, This book has grown out of a philosophy of caring by sharing. Those wishing to shape thoughts or activities around a specific theme will find much on which to draw. The book begins with the months of the year. The very name of each month may provoke ideas. There follow suggestions suitable for the seasons of nature and church, and for particular anniversaries falling within each month. International commemorations, national days and appeals are included, often with helpful background comment. 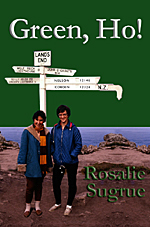 Many of us know the date of Waitangi Day or Hiroshima Day, or when Mother’s Day or Labour Day fall, but Rosalie draws attention to occasions such as World Health Day or Heart Week that otherwise may pass us by. We may also wish to mark Walk to Work Day, Maori Language Week, Sign Language Week or World Habitat Day. It’s all here. The months of the year are followed by a section on games. There are parlour games, moving and mixing games, party games for active people, games for young people, large space games and games for Christmas. There are simple instructions for games suitable for everyone regardless of levels of fitness or confidence. There are also quizzes on general topics including New Zealand facts, random items of history and word teasers and a separate section of Bible quizzes. As Theme Scheme was originally compiled for church groups, there is a helpful section on special Sundays and church activities relating to such events as saints days, Bible Sunday and Week of Prayer for World Peace. For those wanting some new and participative way of marking an occasion or introducing an idea, Theme Scheme has a surfeit of resources. It is a place to begin but, as Rosalie says, use members’ expertise where possible and don’t forget their whanau, free leaflets, libraries and the Internet. She also offers some general pointers and tips for running small group meetings to ensure that meetings are well-organised yet flexible and happy occasions where everyone feels included and valued. This review scarcely does Theme Scheme justice. It is overflowing with ideas developed from the author’s own experience with groups. It is available in hard copy or as an ebook. in Word & Worship: Winter 2014. 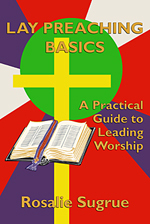 As reviewed in Word & Worship: Winter 2014 (see below) and featured on Maren Tirabassi’s Gifts in Open Hands blog. The first section covers a whole year, month-by-month, to help you celebrate New Zealand and international anniversaries, national days, organisations and causes. Games are a wonderful way for folk to mix and get to know one another. There are easy instructions for indoor and outdoor games suitable for active, young people, through to less mobile, older people. Great for convenors, leaders, teachers and diversional therapists. The book also includes sound, straightforward guidelines for running small group meetings, covering rules for happy meetings, an agenda and minutes structure, and the role of the person leading the meeting. Special Sundays and church related activities through the year are highlighted. 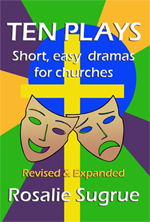 This section also notes related plays and readings in Rosalie’s companion book Ten Plays: Short, easy dramas for churches (available in print and as an eBook). The last two sections of material for themed quizzes and trivia competitions on general and Bible topics will keep your group entertained and interacting with each other throughout the year. Common Expressions: Are they from Shakespeare or the Bible? Who or What completes the phrase? 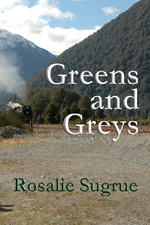 Rosalie Sugrue has been organising programmes all her life beginning at age 10, when she initiated a Secret Six Society for classmates in her street. 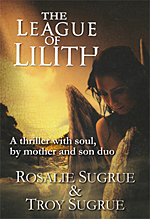 With support from her mother, (who was banned from meetings but permitted to provide snacks), weekly meetings, complete with passwords, minutes and planned programmes, lasted for two years before morphing into a Junior Red Cross Society with a larger membership and a more ambitious programme. Rosalie went through Girl Guides, helped with Brownies and was a Boys Brigade leader. She has taken leadership in Sundays Schools, Youth Groups and student camps. A feminist at heart, Rosalie was instrumental in bringing women into full membership of New Zealand Jaycees, being the first woman to ever address a Jaycee Conference as a (local) member (Rotorua 1974). She has held various positions in National Council of Women, been the National Programme Convenor of the Methodist Women’s Fellowship and organised countless meetings, socials, and U3A groups. Rosalie currently runs social programmes for a group of elderly women. 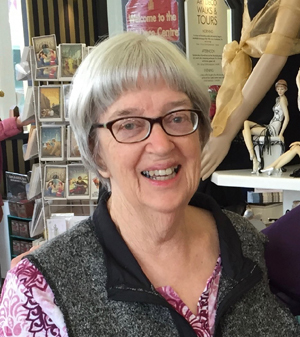 Although retired from primary school teaching, she continues to tutor struggling readers and achieves success by inventing educational games and activities geared to each student’s needs. 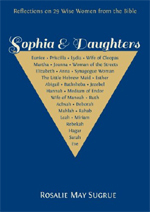 All games and activities in this book have been successfully used in groups that Rosalie has led. She is a lay preacher and has plays, poems, prayers, Bible puzzles and articles published in many church magazines.